SCROLL DOWN OR CLICK HERE FOR SPECIALS, NEW RELEASES AND MORE! Only 27.99 for a limited time only!!! Most of our manufacturers now offer their titles on DVDR as well as on VHS. If the title you want is shown as available on VHS only, please contact us and we'll let you know if it is available on DVDR. The generic DVDRs are nothing fancy. There is no chaptering authoring or custom sleeve artwork. It's just the VHS content delivered on a burned DVDR. ���������� CLASSIC TV IS HERE! Click here to check our our extensive collection�. . .� by Star! Too much talk in your life?� Might we suggest a nice, SILENT film.� We offer a wide selection of silent features and shorts--with more on the way.� Comedy, drama, action, war and more! Classic TV & Video on DVD & Radio on CD! from One of Our Favorite Vendors! 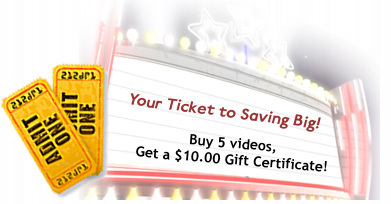 Any time you buy 5 videos from LIFE IS A MOVIE on the same web order, we'll e-mail you a gift certificate for $10.00, good toward any purchase on our site. That's $10.00 for EVERY 5 videos on the same Web order.